Part Two of my two-part celebration of Mr. Caroll Spinney and his two most famous characters on the occasion of his retirement, in which I attempt to unravel the fascinating enigma that is Oscar the Grouch. When I was a kid, I was confused by Oscar the Grouch. While I thought he was funny, I wasn’t quite sure what his purpose was, why there was a character on Sesame Street who was so rude all the time, or whether or not it was okay to laugh at him. I was an adult before I realized that Oscar represents the dark side of the street. He’s the rain cloud that helps us appreciate the sunshine. He’s the pinch of salt that keeps all the sweetness on Sesame Street from becoming too saccharine. In anticipation of Steve Whitmire’s 60th birthday next year, I’m celebrating his work and his characters one month at a time in this year-long series, 60 for 60. 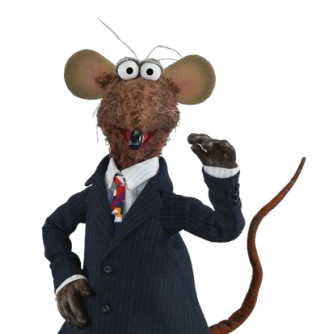 This month, the spotlight is on Steve’s first major Muppet character, Rizzo the Rat. Who is Rizzo the Rat? According to TV Tropes, Rizzo is a Big Eater, a Lovable Coward, and a Jerk with a Heart of Gold, all of which seems accurate and consistent to me. Personally, Rizzo strikes me as a savvy, street-wise opportunist with a talent for self-preservation. However, he has standards, and even though he was born in the sewers, there are depths to which he will not sink. For example, he’s not above taking advantage of his friends, but he’ll never sell them out completely, and he’ll always be there for them in the clinch. When Steve appeared at the Florida Supercon, I received a Google alert regarding video of a Q&A that he did there. Since Raleigh Supercon is run by the same organization, I was expecting another Google alert regarding Steve’s appearance(s) that weekend. Unfortunately, that Google alert never came, but over the weekend, as I was watching some of his other comic con appearances, YouTube noticed and helpfully suggested this video of a Q&A out of Raleigh as something I might like. I had been looking for something like this through most of the month of August, but apparently it hadn’t been uploaded until the middle of September. The same moderator from the Florida Supercon is back again, although he only interviews Steve for about 10 minutes before opening it up for questions, approximately half the time that he spent on the interview portion at Florida Supercon. This is Part One of a two-part series celebrating Caroll Spinney’s two most famous characters on the occasion of his retirement. There’s something magical and miraculous about the mundanity of Big Bird. He does things that other birds do, such as eating birdseed and preening his feathers. He also does things that kids do, like roller skating or playing hide-and-seek. Unlike most Muppets, there’s no need for Big Bird to hide behind a low wall or a counter or inside a giant bathtub. There are no telltale cables trailing off him, and he is unfettered by marionette strings and arm rods. Big Bird walks freely among us, as an equal. Then I watched the video and it completely blew me away. I wasn’t expecting to be so affected by it. Whether it was the music or the Fraggles or the combination of the two that touched my heart, I still don’t know. Remember my review of Phantom of the Opera, the first book in the Muppets Meet the Classics series? Two weeks ago, I received a comment on the review from Erik Forrest Jackson, the author of the book. This was both very flattering and very nerve-wracking: I never expected the author of the book to actually read my review; if I had, I would have tried to be a bit more diplomatic about what I didn’t like about it. But his comment was very kind, and he thanked me for the thoughtful review. The next book in the series is to be released today. Because I was expecting another novel, I was surprised to find out that the next book in the series is Fairy Tales from the Brothers Grimm. If I’m being completely honest, I’m also slightly–just slightly–disappointed, if only because the Muppets have drawn so frequently from the fairy-tale well in the past. Then again, probably the reason why the Muppets so often adapt fairy tales is that the content works so well for them. 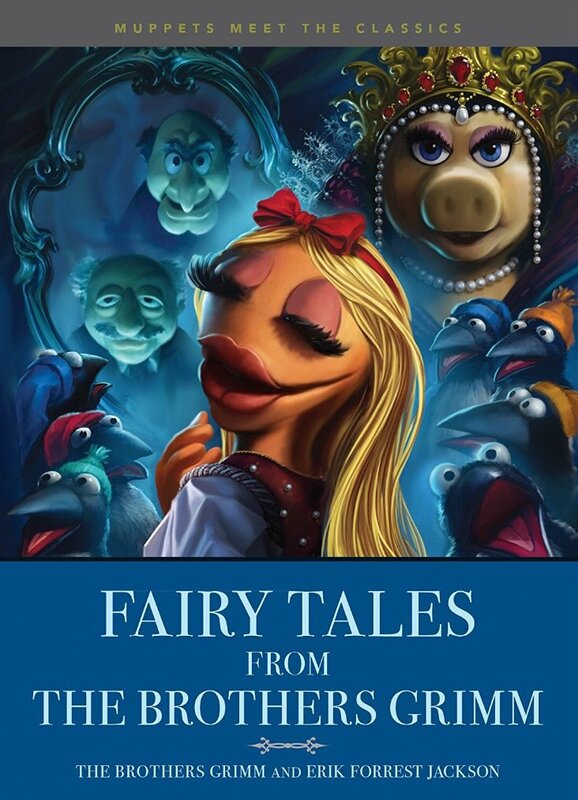 Also, based on the sample chapter that has been released–“The Frog Prince,” one of the most well-known and successful of the Muppet fairy tale adaptations–it looks as though Jackson is able to put a new spin on even the stories that the Muppets have adapted before. Happy birthday to Matt Vogel! Yes, I know that his birthday is actually tomorrow. Today I want to celebrate him and some of his Muppet troupe characters, and tomorrow I want to say something in regard to his work on Sesame Street. When people talk about Matt Vogel, they usually talk about all the characters that were originated by other people that he has nobly endeavored to keep alive. That’s all well and good, but today I’d prefer to concentrate primarily on his original characters (with one exception, but I’ll explain when I get to it).